Tenant Storage Cages Princeton NJ. Complimentary Layouts, Stocked Locally, Generates Revenue, Free delivery. Proudly serving NJ since 1909. Stocked in Single Tier – Full height doors and Double tier – stacked doors in 24 sizes. Each tenant storage cage is made with 4ga welded wire (twice as thick as 10ga) in Rust resistant galvanized, medium gloss black and gray. Each door has a welded hasp for padlocks and full height anti theft lock bars for added security. Tenant Storage Cages Princeton NJ. Stocked locally in 3 colors. Free layouts, Quick delivery and installations. Most residential buildings have the tenant storage cages attached directly to the rooms walls and floors. Backs, floors, shelves and tops can also be included. Units off the wall come with backs in the same material and color. Single tier and double tier range in heights from 6′ high, 7′ high, 90″ high and 8′ high. Depths from 3′ deep to 5′ is standard. Two tier units doors are typically 45″ high, 90″ overall. Our team provides Complimentary Layouts six days a week. Feel free to use the form in the link above or email us for immediate assistance. Tenant Storage Cages Princeton NJ stocks two tier stacked (shown above and single tier – full height doors locally. Free layouts. Tenant Storage Cages Princeton NJ generate revenue. 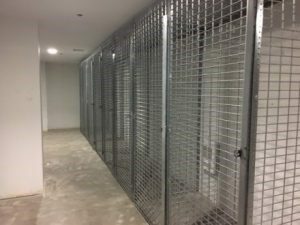 Most developers, Landlords, Condo Boards and Apartment complexes charge a monthly rental fee for onsite storage cages ranging from $85.00 per month to $250.00 per month depending on the size. Residential buildings with 30 tenant storage cages renting out on average for $100.00 per month will generate $36,000.00 in revenue. The Tenant Storage Cages will pay for themselves in 7-8 months. 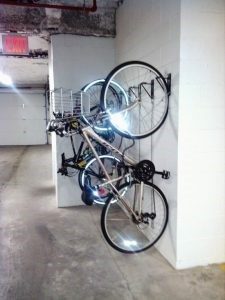 Wall Mount Bike Brackets Princeton NJ. #42488 has been designed to allow bikes to be stored just 12″ apart when space is tight. Locking. Free layouts. 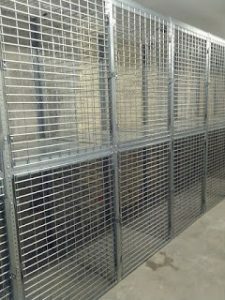 Posted on March 25, 2019 Author LockersUSACategories Tenant Storage Cages Princeton NJTags Security Cages Princeton, Storage Cages Princeton, Tenant Storage Cage Princeton NJ, Tenant Storage Lockers., Wall Mount Bike Brackets Princeton, Wall Mount Bike Racks Princeton, Woven Wire Partitions Princeton NJ. Conveyor Guarding Safety Fence Long Island City NY. Conveyor Perimeter Guarding helps prevent worker injuries. Proudly Serving NYC since 1909. Ideal for conveyor lines at Manufacturing, Internet Fulfillment, Commercial Laundry, Bakeries, Logistic companies, Warehouse, Distribution. Complimentary Code Compliant Layouts, Quick delivery and installation. Phone (917) 701-5795. Conveyor Safety cannot be overlook with so many moving parts above and below. Protect your workers. Reduce cost of doing business by maintaining productivity while reducing downtime, We can help you meet OSHA and other safety regulations with our complimentary onsite code compliant layouts. Stocked locally, Quick delivery and professional installations from our 109,000SF facility. Our modular system consists of three post heights, six styles of doors, and over 30 pre-fabricated wire-mesh panel sizes and accessories. All pieces assemble and install precisely and quickly. You’ll enjoy worker safety, less downtime, compliance with federal safety regulations, and have fewer machine-guarding problems to solve. Designed to allow maintenance work to be done by removing secured panels quickly, While preventing workers to enter the conveyor area. Conveyor Guarding Safety Fence Long Island City NY is open six days a week Monday – Friday 7AM – 5PM and Saturdays 7AM – 4PM. 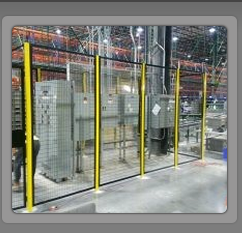 Conveyor Safety Fence modular system of posts, Framed welded wire mesh panels, and doors, with ample options in each. All components are manufactured for exact fit and easy assembly. These systems combine higher security, structural strength, and great flexibility. They’re simply the best low-cost alternative to building permanent walls while providing an OSHA compliant barrier for conveyors. Fast delivery – Stocked locally in Queens. system materials are in-stock and ready to ship within 3 days. Strength – 10-gauge welded wire mesh with 1-1/4″ x 2-1/2″ grid openings, welded to 1-1/2″ x 1-1/2″ x 14-gauge steel angle frames. Machine Guarding Safety Fence Long Island City. Enclose electrical equipment and machinery. Stocked in LIC in 4 standard heights. Complimentary onsite layouts. Conveyor Guarding Safety Fence Long Island City NY, Conveyor Safety Cages Long Island City, Conveyor Safety Cages Long Island City NY, Machine Guarding Safety Cages Queens NY 11101. Conveyor Guarding Safety Fence delivered daily to Long Island City, Maspeth, Queens NY, Astoria, Brooklyn, New York City, Staten Island, Bronx, NYC. Posted on March 12, 2019 Author LockersUSACategories Conveyor Guarding Safety Fence Long Island City NYTags Conveyor Guarding Safety Fence Long Island City NY, Conveyor Safety Cages Long Island City, Conveyor Safety Cages Long Island City NY, Machine Guarding Safety Cages Queens NY 11101. Conveyor Safety Fence Kearny NJ. Guarding Conveyors and Machinery you use to prevent worker injuries. Proudly Serving New Jersey since 1909. Equally important as building or using it. Conveyor Safety cannot be overlook with so many moving parts above and below. Protect your workers. Reduce cost of doing business by maintaining productivity while reducing downtime, We can help you meet OSHA and other safety regulations with our complimentary onsite code compliant layouts. Stocked locally, Quick delivery and professional installations from our 109,000SF facility. Our modular system consists of three post heights, six styles of doors, and over 30 pre-fabricated wire-mesh panel sizes and accessories. All pieces assemble and install precisely and quickly. You’ll enjoy worker safety, less downtime, compliance with federal safety regulations, and have fewer machine-guarding problems to solve. Designed to allow maintenance work to be done by removing secured panels quickly, While preventing workers to enter the conveyor area. Conveyor Safety Fence Kearny NJ is open six days a week Monday – Friday 7AM – 5PM and Saturdays 7AM – 4PM. Conveyor Safety Fence Kearny NJ. Avoid serious injuries. Code compliant onsite layouts, Stocked locally. Sales@LockersUSA.com or Phone (917) 701-5795. Conveyor Safety Fence Kearny NJ is a modular system of posts, Framed welded wire mesh panels, and doors, with ample options in each. All components are manufactured for exact fit and easy assembly. These systems combine higher security, structural strength, and great flexibility. They’re simply the best low-cost alternative to building permanent walls while providing an OSHA compliant barrier for conveyors. Fast delivery – Stocked locally in New Jersey. system materials are in-stock and ready to ship within 3 days. Machine Guarding Safety Fence Kearny NJ. Our local inventory also includes Code compliant Machine Guarding Safety Cage to enclose electrical equipment, Machinery, Etc. Free code complaint layouts. Conveyor Safety Fence Kearny NJ, Conveyor Machine Guarding Cages Kearny, Conveyor Barrier Guarding, Conveyor Safety Fence NJ, Machine Guarding Conveyors Kearny NJ 07032. Conveyor Machine Guarding Cages New Jersey, Conveyor Safety Fence delivered daily to Kearny, Newark, Jersey City, Harrison, Secaucus, North Bergen, Perth Amboy, Edison, Carteret, Woodbridge NJ, New Jersey.